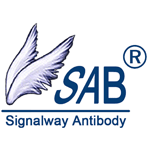 SAB provides custom antibodies to customers worldwide, including researchers at universities and in biotechnological and pharmaceutical companies. With more than 20 years in academic antibody research and monoclonal antibody works’ experiences, our scientists are very happy to help you in the design and selection of antigen epitomes and the production of numerous antibodies. Listed below are the different customer services we offer. Complete confidentiality of all orders is assured.